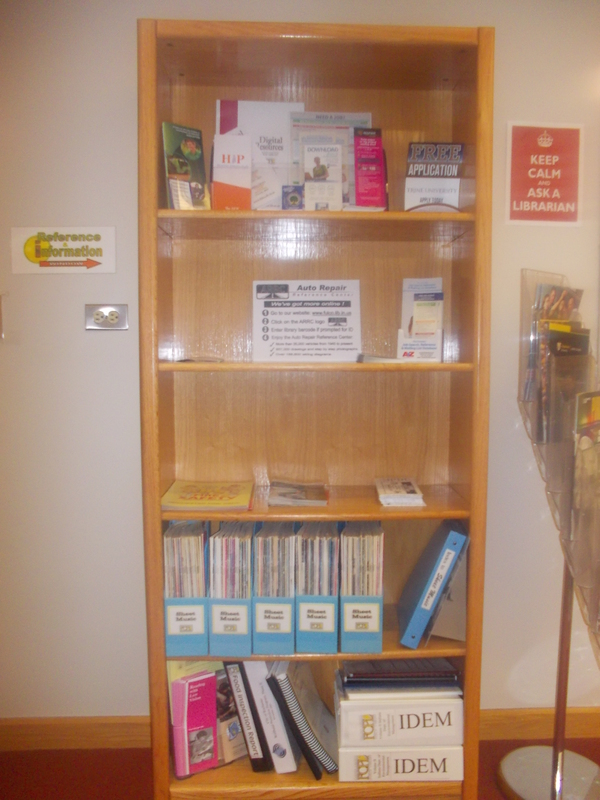 Moving to the left of the Grant Station, I encountered this bookshelf loaded with information and resources. The sign to the left of the bookshelf points me to the Reference and Information window (more on that later). For now, this bookshelf deserves a serious look because it offers a great deal of information. 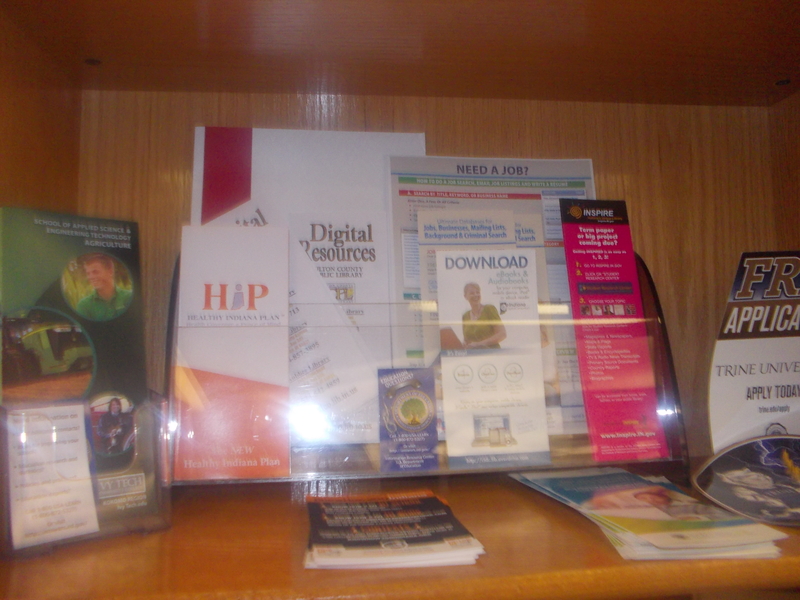 On the top shelf alone, I found brochures, bookmarks, flyers, business cards, and folders loaded with helpful resources. Contact information for the Department of Education for information on local education contracts, ideas for improving schools, education research and statistics, policies and practices, or locating education experts. 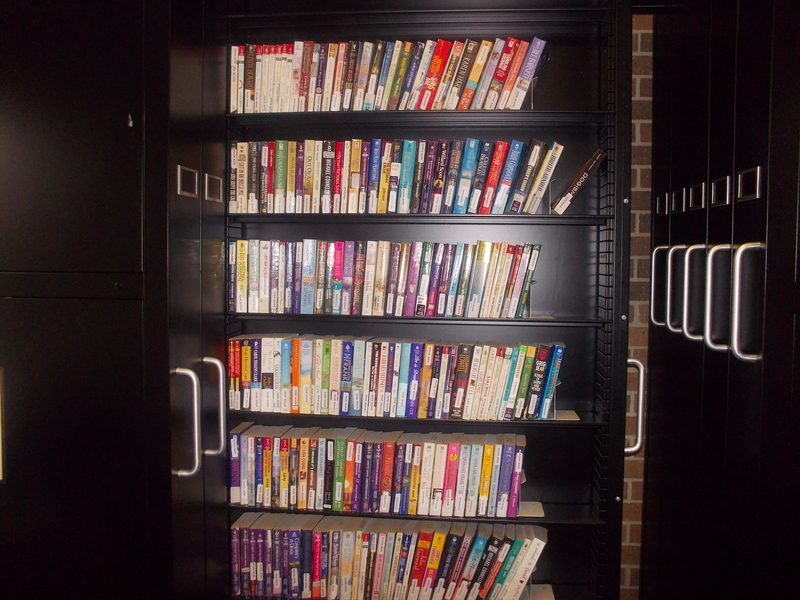 A listing of digital resources offered by the Fulton County Public Library free of charge which include: 3M Cloud Library, Ancestry.com, ARRC, AtoZ Databases, Britannica, Cypress Resume, Freegal, Inspire, HeritageQuest, Hoopla, Mango, Overdrive, Small Engine Repair Reference, Tumble Books, and Zinio. Those who have an Evergreen Indiana library card, an Evergreen PIN and a working email address will be able to access these services at http://www.fulco.lib.in.us. 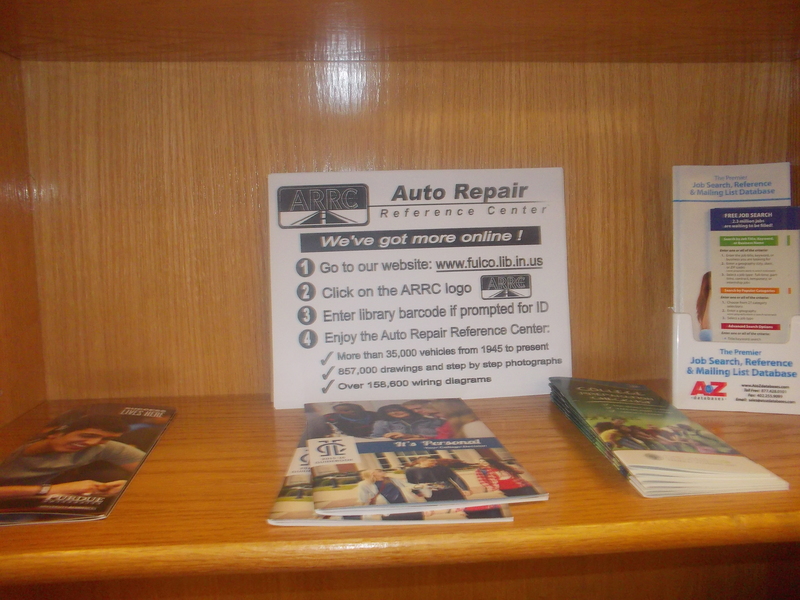 Moving to the second shelf I found more information about colleges, job searching, and flyers highlighting our Auto Repair Reference Center (ARRC) database. The ARRC boasts information about more than 35,000 vehicles from 1945 to present, 857,000 drawings and step by step photographs, and over 158,600 wiring diagrams. 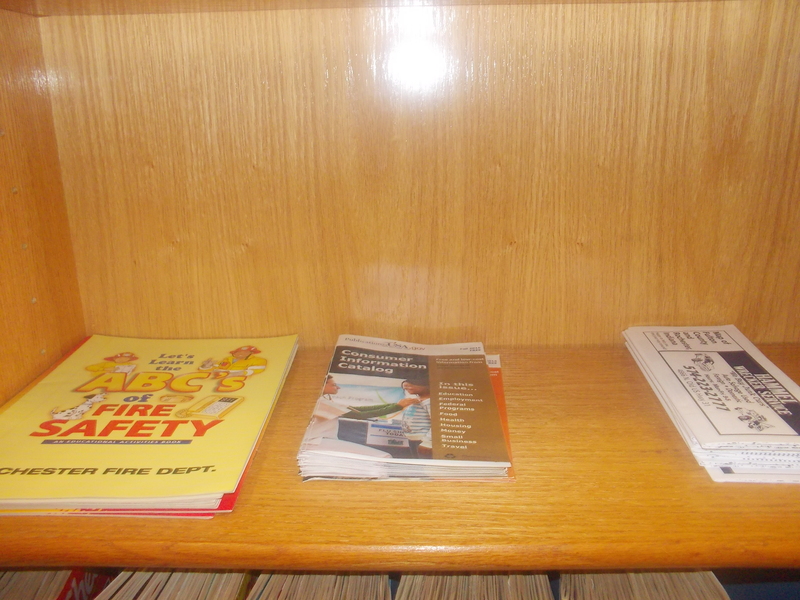 The third shelf sports free coloring books about fire safety for some of our tiniest patrons, a consumer information catalog, and a map of Fulton County and Rochester, Indiana. 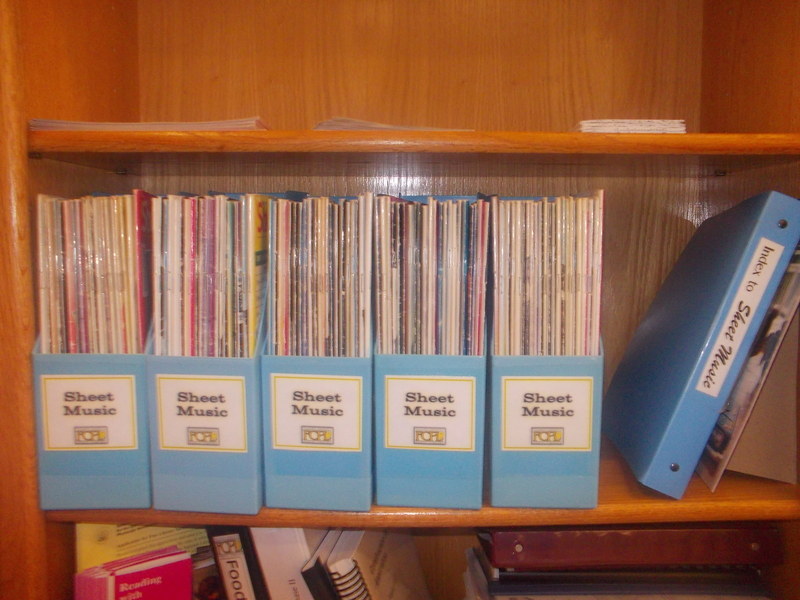 On the fourth shelf, the contents switch from general information to barcoded sheet music that patrons can check out. To the right of the actual sheet music is a sheet music index to make finding a specific arrangement easier. The fifth and final shelf packs in a lot of important information. The brochures on this shelf all pertain to services for the handicapped. There is an application for free individual library services to meet the needs of the blind, visually handicapped, physically handicapped, reading disabled and deaf. Approved applicants will be eligible to receive library materials with special accomodations such as playback machines and accessories. 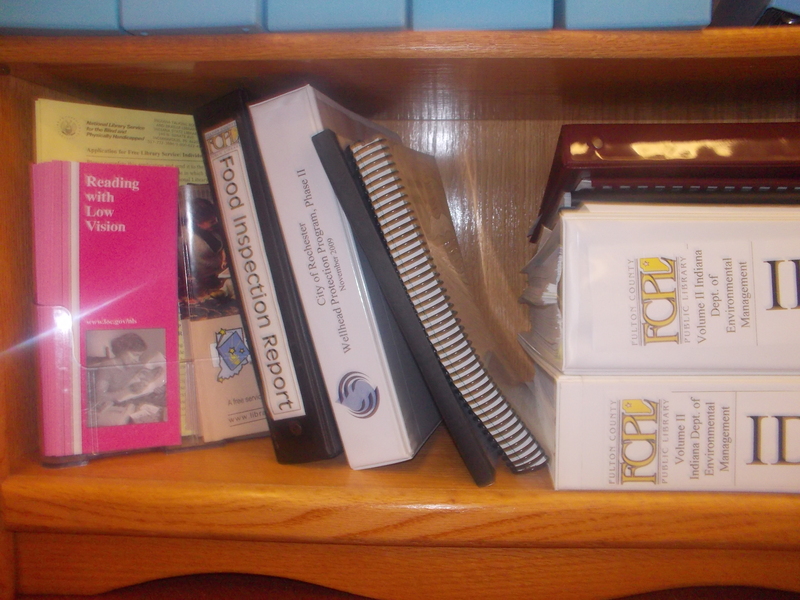 The remainder of this shelf contains various bits of legal information such as food inspection reports, the city of Rochester Wellhead Protection Program information, and many documents from the Indiana Department of Environmental Management (IDEM). The older IDEM documents reside on this shelf. The newest ones are publicly posted elsewhere. There are also copies of various permit applications and notices of decisions made by IDEM. Many communities are now offering Little Free Libraries. The basic idea is simple: take a book to read. Keep it or return it. 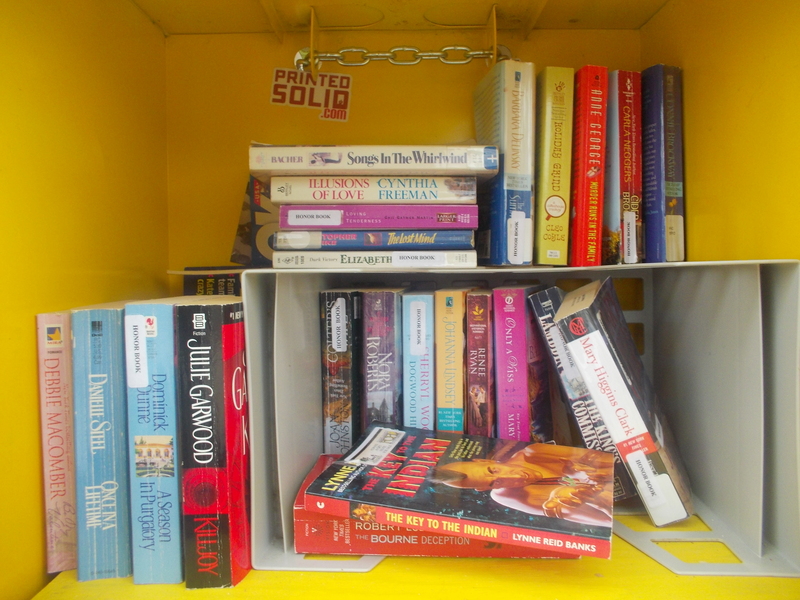 Patrons may donate their used books directly to the Free Little Library. Our community is fortunate to have several Free Little Libraries. I found it interesting to learn about how these Little Free Libraries were set up and how they are maintained. When I realized that this process begins in the Reference Department of the Fulton County Public Library (FCPL) right behind Grant Station, I just had to do some investigating. The Sentinel, our local newspaper, donated several old newspaper vending machines which turned out to be the perfect size for use as a Free Little Library. These old machines also have the advantage of being water proof which is important in a community with cold, wet winters. 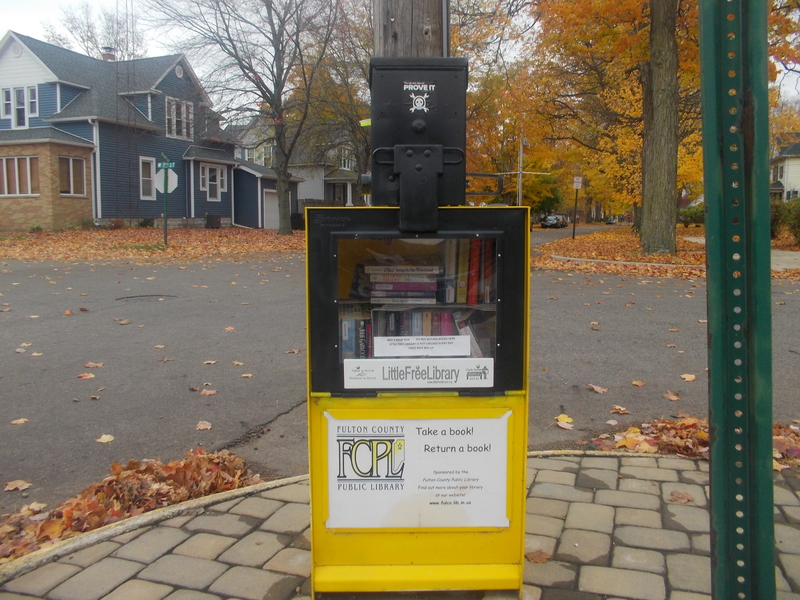 One such Little Free Library sits outside of the Fulton County Public Library in Rochester (the first picture) and is available even when the library is closed. A precautionary measure of sealing any holes to prevent bug infestation has been taken. Two others are located in Talma and Grass Creek. Both areas are unserved by a library. This is one way that the FCPL reaches out to unserved neighbors. 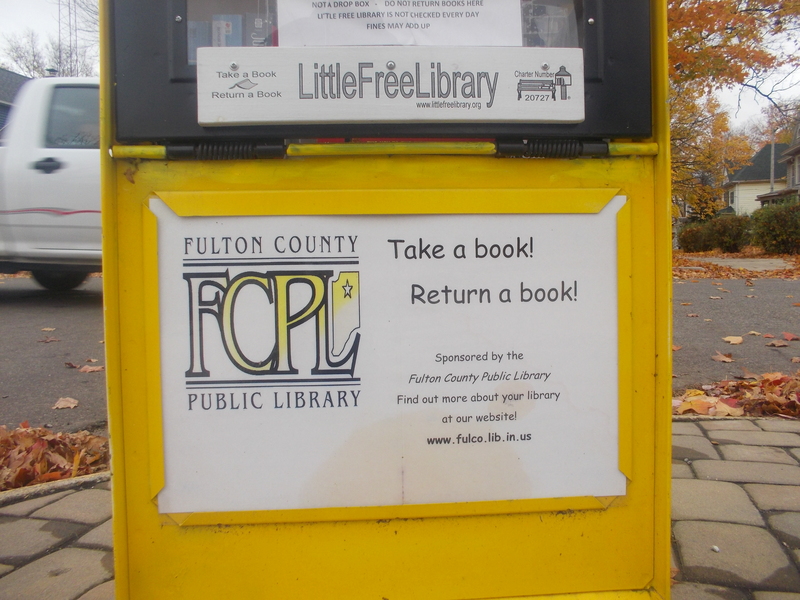 In addition to books directly donated into the Free Little Library, The Fulton County Public Library also makes periodic checks of the Free Little Libraries and replenishes books from time to time. I was curious about how books are chosen for each library. Behind Grant Station in the Reference Department is a bookshelf that is a work in progress. 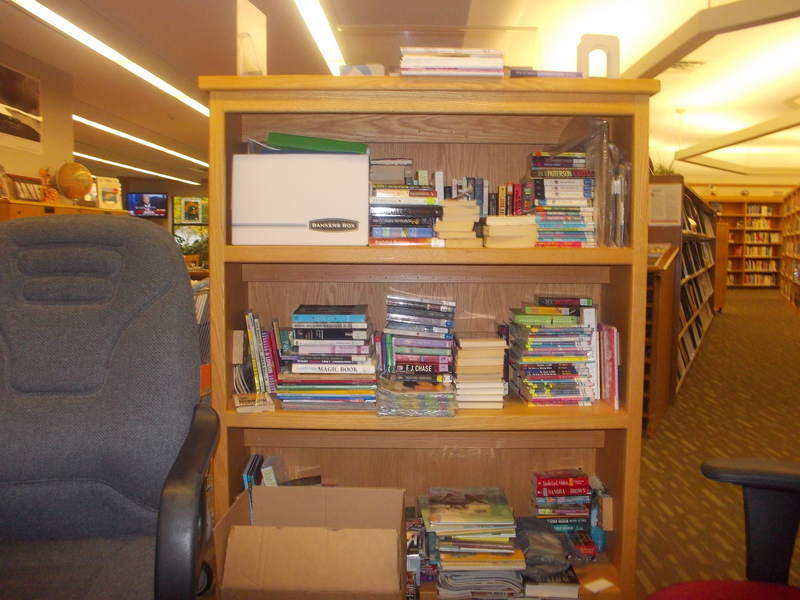 All of the books and magazines that land on this bookshelf have either been withdrawn from FCPL (which makes room for new ones) or they have been donated by public library patrons but are not needed in the library collection (for example if we received multiple copies of a book). These books and magazines actually end up in various locations. The items shown here are destined for area nursing homes, the jail, the honor book collection, or the Free Little Libraries. Of those destined for the Free Little Libraries, it is interesting to note that the location and populations vary. FCPL attempts to target specific books for specific populations. For example areas with more children are left with more children’s books. In some areas there is a high population of Amish patrons who use the Free Little Libraries, so books at those locations tend to reflect the types of books that Amish patrons might choose. As part of the FCPL community outreach programs the books that do not go into the Free Little Libraries are also targeted to certain populations. There are some special considerations for placement. Nursing homes generally prefer larger print books. Books destined for the jail must meet certain criteria. Our local jail requires paperback books that contain nongraphic material and don’t promote violence. As a result the types of books taken to the jail tend to be paper back, nonfiction, self help type books. Some magazines are acceptable to the jail, but inserts with sharp edges must be removed first. All staples in the magazines must also be removed before donation. When the jail books are dropped off, they have to be approved by jail staff before the inmates are permitted to read them. 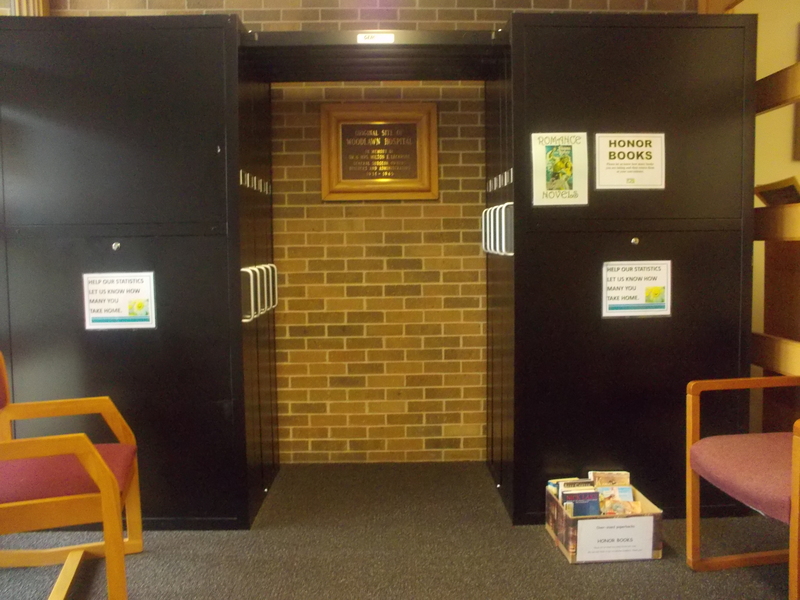 The remaining books go to the FCPL Honor Book collection. These books are actually labeld “Honor Book” and are placed in either the Pontiac Entrance foyer or the Fulton Entrance foyer. Most of these books tend to be paperbacks, but there are some exceptions. Honor Books are books that aren’t barcoded and don’t have to be checked out on the patron’s library card. 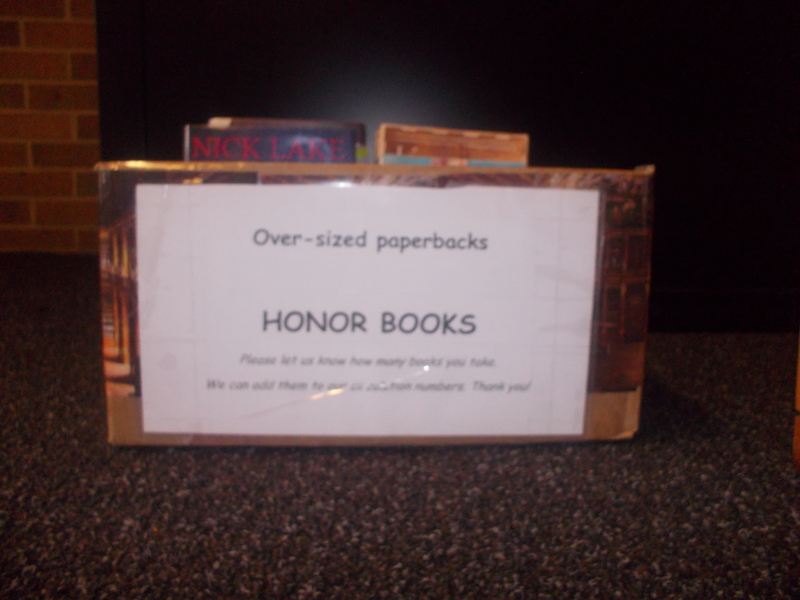 Patrons are requested to let the Adult Circulation desk know how many Honor Books they have chosen. The books are then recorded as “In House Circulation” items. Patrons are on the honor system to return these books. The Pontiac Entrance Foyer has books in black cases with doors that pull out sideways. Slightly larger books do no fit well into these cases, so there is a box for them on the floor. 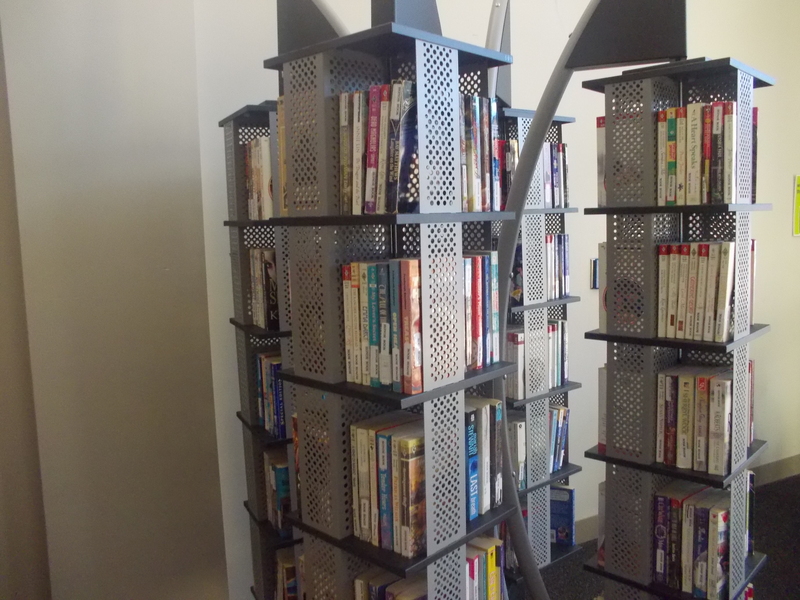 Honor books in the Fulton Entrance Foyer are displayed on spinners. The community response to the Free Little Libraries and community outreach is overwhelmingly positive and popular.